Talk about a powerhouse of nutrition! Not only is oleracea rich in vitamins A, C and E, plus iron, calcium and potassium, it contains more Omega-3 fatty acids than any other leafy vegetable in the world. Even my beloved spinach can’t make this claim. As for taste, I’ve found that stems cut in the morning are rather lemony. Picked in the afternoon, they are pleasantly bitter, like arugula. Only in the United States is this plant woefully ignored. In Greece, chopped stems and leaves are commonly combined with Feta cheese and olives for a famous salad. Other cultures rely on the mucilaginous quality of the leaves to thicken soups and stews. My Mexican neighbor likes to saute both the stems and leaves for Pork with Mole Sauce; she also uses them in a scrumptious egg dish. Mind looking for this wondrous weed on your property? 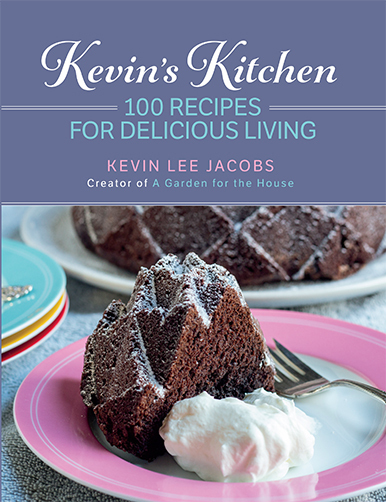 I only ask because I wish to post a recipe which uses the plant. (Update: here’s the recipe.) It tends to favor sunny, dry spots. As you can see in the photo above, mine grows with utter frequency between the the gaps of the brick walkway in my Rose Garden. 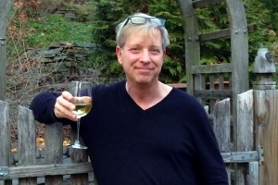 Yes I have this weed – and HOW! Please post that recipe! We get a ton of purslane in our CSA share—yep, we're paying for weeds. Last week, I grilled zucchini, and cut it up and put it with cucumbers and tomatoes and then sprinkled the purslane on top, then put on grilled sea scallops with a lemon vinegrette (from epicurious.com). Purslane was pretty delicious actually! Claire – Imagine that! I had no idea that CSAs were including purslane in their shares! The scallop recipe looks almost too tempting. On my “to-make” list now. Well, it's nice to know this weed has some redeeming value. Plenty of it on a gravel path in my yard. Think I'll try the recipe that Claire linked to above. Does this plant have pink to reddish blooms during the mornings? Anonymous – Portulca oleracea's flowers, which open only on sunny days, are definitely yellow. I'll try to get a picture of the flower next time the sun comes out. Too wet and gray here now! Only plant this plant in a container; not in your flower garden or you'll be sorry. It becomes invasive and grows very fast, mine had pretty yellow flowers on it. It is in the sedum family if I'm not mistaken. 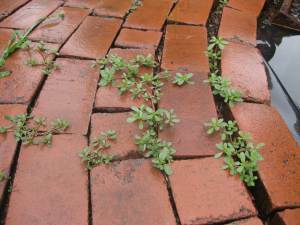 Betty819 – Even in a container outdoors this purslane/pigweed/littlehogweed/verdolagas would be difficult to control. The plant propagates by reseeding, and the seeds can sprout anywhere. The plant is in the Portulacaceae family. But please, PLEASE! Post that recipe! I'm a bit tired of roasted tomatoes… I need something new! hehe! I think I have that in my yard. Donna B. – Yes — use it like okra for gumbo, and let me know what you think! The Japanese Redneck – You probably do have this great weed in your yard. Maybe try it on a salad; it's really delicious, so good for you. 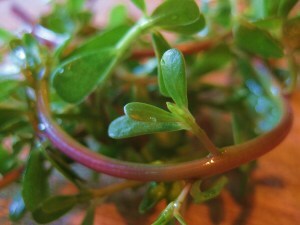 Actually, medieval European recipes are chock-full of purslane (check the website Gode Cookery. just type “purslane” into the search box; or try Sir Kenelm Digby’s cookbook). They used to pickle it, serve the stalks parboiled in vinegar and sugar, use them as one of many salad greens, use them in potages (basically, soup that was poured over bread), and so on. There are a number of “weeds” which we no longer use (dock, sorrel, borage, primroses, violets) in our food that were, apparently, popular previously. And some, like this one, require no cultivation. Which, of course, pollutes less. Purslane has a look-a-like that you should not eat ,”spurge ” , It looks very much like purslane but when you snap the stems it oozes a milky like juice (like a dandelion stem ) Purslane stems do not have that milky ooze . 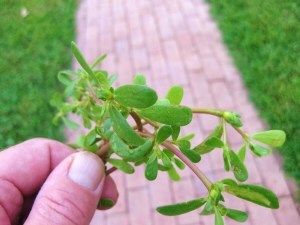 Purslane is a summer favorite around this Grandmother’s house and I freeze it for winter soups as well . I’ve been eating purslane for almost 50 years, but never knew it had so much omega 3! I love it–use it raw in salads, throw it into soups, and stew it up with tomatoes, garlic, onion, and whatever other veggie is on hand. It does have a slightly gelatinous quality when cooked (husband agrees with those who say “slimy” but I think that’s just being rude to the purslane). This property enriches dishes, I think. Stoney Finnegan, can you tell me how you freeze it ? my Mom use to can it but honesty i do not have the time. vinegar and olive oil and still do. Kevin, only you can hit a homerun week after week. I know this plant, a weed in my yard. Who knew? Many thanks for an eye-opener. It grows all over the place!!! It even potted itself in my little container garden. I’ve been finding lots of recipe references. Its great just plain, I munch on the leaves as I’m puttering around. My aunt up in Ohio used to saute it with a little onion and bacon! Talk about GOOD! It makes a great BPT sandwich. I like it better than the lettuce! Awesome in stir fry and every vegetable saute I’ve tried. Am going to try and pickle the big leaves with stems. Found a reference to that from, I believe, the 1600’s. Maybe 1700″s? Its fun stuff!!! And it thrives in the Summer down here in Florida, so its a win-win situation! Hi Joan – If the seeds are those of Portulaca oleracea, then yes, the plants will be edible. The Portulaca grandiflora or “Moss Rose” that is commonly bought in seed packets is NOT edible.